Well this is it ladies and gentlemen - the final edition of TLFG for the 2016/17 season. It's been another hectic year and generally a very good one for London football. Did you know that for the first time ever London clubs have claimed the top two spots in the top division and provided both FA Cup finalists? I have author Steve Tongue to thank for this excellent fact after going to see his appearance at the London Festival of Football Writing on Saturday night. He was promoting his fine book on the history of London football which I would highly recommend you read if finding out about such a topic interests you. The event brought the festival to a close after several nights of discussion and debate at Waterstones bookshop on Tottenham Court Road. Did you go to any of the sessions? On Saturday, Steve was also joined by fellow sports journalists Mina Rzouki, Jacob Steinberg and Philippe Auclair who covered a huge range of subjects concerning the past, present and future of football in the capital. I even got a question in about non-league football and its chances of future success. I'd never been to any kind of literary festival before but this was right up my street and look forward to the next one. 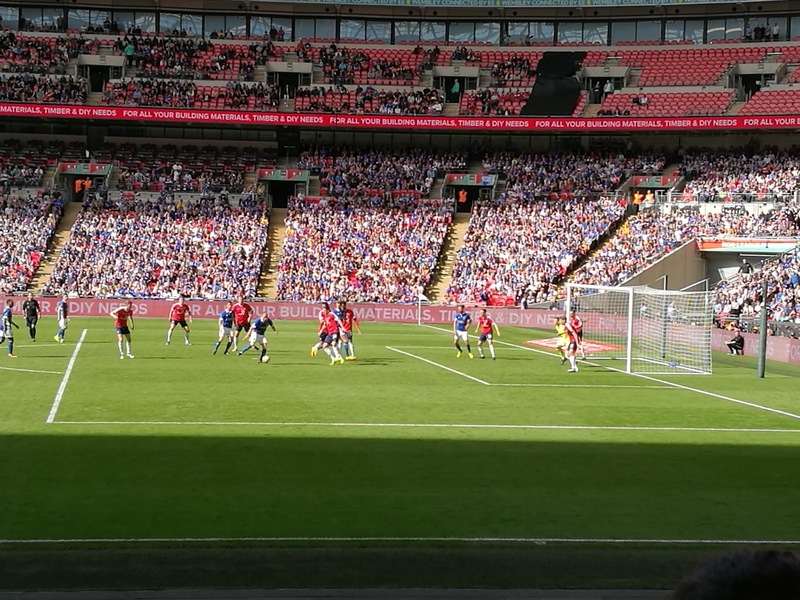 My Sunday was completely taken up by Non-League Finals Day (NLFD) at Wembley where visitors get to watch the finals of the FA Vase and FA Trophy back-to-back. Last year was the first time the two had been played together on the same day and there were a few teething problems, particularly the management of the two-hour break between games where fans were kept inside the stadium and little provision was made for them. This year, the lock-in continued but the facilities were a lot better. Food and drink was in good supply which definitely wasn't the case last year, there were pop-up pubs with sofas, tables etc showing live Sky coverage of the final day of the Premier League season and there were various other entertainments like table football and football freestylers to keep people amused. It was also great to see the amount of neutral supporters on the concourses in their various kits and strips and the general bonhomie between them. In my section, primarily for Cleethorpes fans, I spotted a diverse collection including Romford, Billericay, Brighton, Man Utd, Chester and Grimsby. There were also quite a few people in various German club tops like Hertha and Hamburg and I even spotted an FC Copenhagen one. It is more and more people like these that will ensure this event stays at Wembley and thrives there as the competing clubs alone will probably never fill out the stadium completely. The attendance of 38,224 was down on last year but that was always likely to be the case after former Football League club Hereford brought 20,000 fans to the FA Vase final to slightly skew things last time around. However, it was higher than the crowds at Burnley, Hull, Leicester, Southampton, Swansea and Watford who were all completing their Premier League campaigns at the same time. The matches themselves produced an impressive haul of nine goals. South Shields, the best supported side on the day, were expected to start as favourites against Cleethorpes Town and duly dominated a game which they went on to win 4-0. Although they had plenty of chances, they were only leading 1-0 until the latter stages when Clee conceded a second and then collapsed in the final five minutes. Despite the drubbing, Cleethorpes' goalkeeper Liam Higton was absolutely superb, pulling off numerous saves from all angles as the Mariners pushed for victory. The FA Trophy provided a much more balanced and entertaining game with Macclesfield and York serving up a five-goal thriller. Having suffered a heartbreaking relegation on the final day of the league season, the Minstermen came into the game as underdogs but with veteran heavyweight striker Jon Parkin (previously of Preston North End) up front they had a chance. And it was he who gave them a surprise lead with a deft header after the Silkmen had made the brighter start. It didn't last long though as Macclesfield quickly equalised and the game opened up. 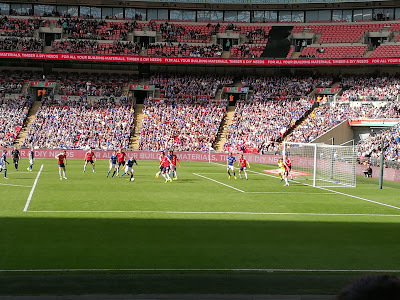 York took the lead again before the goal of the day arrived right on the stroke of half-time when Ollie Norburn crashed a shot into the roof of the net from 25 yards which brought many to their feet. The second half was more cagey and extra-time looked highly likely until Parkin caused havoc in the penalty area again and with his partially blocked shot looping towards goal, substitute Aidan Connolly poked it over the line to grab victory. It brought a fine end to a generally fine day. NLFD still isn't quite perfect. The lock-in imposed by Wembley is annoying as it means fans that do attend for both games are looking at at least a six-hour stay inside the stadium. This is tricky if you've got young kids and pretty challenging for smokers who are strictly forbidden, officially, from lighting up. It also discourages fans of teams in the second game from turning up early as once you're in, you're in. Staying in neighbouring pubs and restaurants outside the ground which may well be cheaper is a far more attractive option for many. As I said before, the future success of this event is going to depend on how much it appeals to neutrals. I've also mentioned many times before, that club rugby matches at Wembley frequently come close to selling out because of the rugby community's willingness to get behind big events and support their game no matter who is playing. The non-league community need to develop that too. There are certainly enough of us out there so it should be possible but it will take time. It is a fun day out, there were loads of families present and the atmosphere is relaxed - the support was passionate but I don't remember any real taunting of the opposition, it was largely positive backing of their own players. So that's it for another year. I'm going to take this week and June off and intend to get going again around 2 July. To mark your card, the Emirates Cup returns this summer with Arsenal hosting Benfica, RB Leipzig and Sevilla over a weekend at the end of July. Tickets for this go on general sale on 7 June and usually sell out fairly quickly so put the date in your diary if it appeals. Crystal Palace have also announced a friendly against German giants Schalke in early August - tickets are on sale now. Fixtures for the new season in the Premier League are released on 14 June while those for the EFL come out a week later on 21 June. Non-league fixtures usually follow in July. With my summer holiday coming in mid-July I don't have anything big planned for June but if you're off to the Champions League final or Euro U21s in Poland have a great time. Finally, I'd like to give a huge thanks to all of you for reading and all of those who have contributed with ground reviews, photos, comments and questions - its what makes it all worthwhile. I look forward to welcoming you all back again in July. There are only 6 matches in the London area over the next few days with the FA Cup final and two EFL play-off final among the highlights. Arsenal v Chelsea @530pm - the season comes to an end for our local top-flight teams with this fantastic showpiece game at Wembley. For any American readers, this match is probably the closest equivalent we have to the Super Bowl. The Gunners will be using it as a chance to save their season after failing to qualify for the Champions League for the first time in 20 years. If they win, it will be the third time in four years and will make them the most successful club in the history of this famous competition. The Blues, on the other hand, will be going for the double after already bagging the Premier League title. Tickets have sold out so your only route is likely to be hospitality, agencies or the black market - in other words £££ will be required!